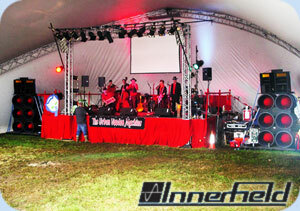 Innerfield are taking bookings for our complete sound package for festival stages and venues. The Innerfield soundsystem has been enjoyed at festivals and other events for 8 years, including the Drifts stage at Glastonbury, main stages at the Rocket Festival in Spain, Bloom Festival, Eastern Haze, and Lost Vagueness. It was originally designed and built by our in house team of engineers for a tour of the Balkans with Matt Black of Coldcut in 2000. The unique 'Ballistic Bass Bins' were designed by Turbosound guru Laurence Dickie and assembled by Innerfield's engineers and they sound as good as they look. Innerfield regularly works with C3Audio from Brighton to provide a complete sound package for festival stages of any size. C3Audio was formed by 3 experienced engineers who individually have worked across the globe with artists such as Kasabian, Juliet Lewis, KRS-1 and Bloc Party. They provide technical crew to events across the broad spectrum of the 'rock n roll' industry and have worked in partnership with Innerfield for the past 3 years. All our crew have many years individual experience working in professional audio and include stage managers, tour managers as well as respected monitor engineers, FOH engineers, system techs and backline techs. 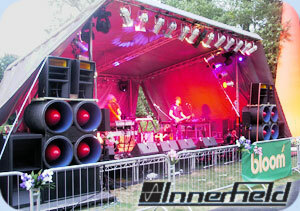 For larger stages and venues we are proud to offer a Turbosound Aspect front of house PA system. An industry standard for live bands Aspect has been used at the John Peel stage at Glastonbury, Roskilde main stage (the largest rock festival in Europe) and toured by demanding and discerning legendary artists such as Dave Gilmour (Pink Floyd) and Primal Scream. The system is breathtakingly clear and detailed in the top end and delightfully expressive and musical in the crucial mid range. Engineers love using the Aspect as they can bring out the very best in any performance. We also believe that being a point source system it allows for much greater flexibility in covering a defined audience area. This eliminates the fundamental problems with using line-arrays at festivals, which generally have very wide horizontal dispersion throwing sound out wide from the stage which can cause problems with local residents. The 18K of Innerfield bass speakers partner the Aspect Mid-High speakers perfectly in combination with Turbosound TSW 218, 718, and TA 880 Aspect bass for larger stages. On stage we offer Turbosound fully bi-amped monitoring with Turbosound Aspect sidefills, up to 25kW on-stage sound. Our basic festival package includes Soundcraft 32 channel desks for monitoring and FOH although we are happy to supply 48 channel Midas analogue desks at both ends if required. If digital consoles are preferred we can offer, with some notice, Yamaha PM5D or Digico D5 desks at either end of the multicore with our fully trained technicians. We have an exhaustive selection of industry standard dynamics and FX to satisfy the majority of technical riders, and are happy to source any specialist gear if required. For medium to small stages and venues we can supply Void Acoustics Air Motion Mid-Hi speakers. The stunning original Air Motion horns are the perfect style partners for the Innerfield bass and they sound great too! 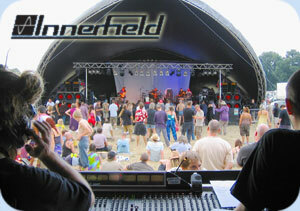 Book Innerfield for your dance tent or VIP bar and delight your guests with the funkiest looking sounds around. We carry full Public Liability insurance, and have a CIEH certified Health & Safety Officer who is capable of providing Risk Assessments. We take noise pollution very seriously and provide measured Sound Pressure Level at front of house throughout the event as a matter of course. 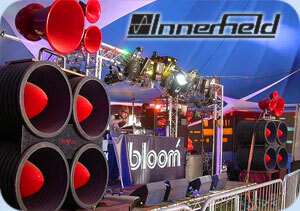 "Innerfield have been providing sound for our festival stages for 4 years. The crew are professional and friendly, the system looks incredible and the sound quality is second to none. I wouldn't hesitate to recommend them to production managers for a festival stage of any size." In addition to sound services, Innerfield can draw on extensive experience and contacts to assist in all areas of festival planning and implementation. We are happy to help with pre-production, structures, lighting, video, production facilities, comms. "As the production manager of a small festival I was delighted to have Innerfield providing sound for both our stages at Bloom. Our audience and our artists loved the sound and the professionalism of the crew. Innerfield provided stage management and helped us source structures and lighting too. It was great to know that the stages would run smoothly throughout the weekend leaving us to manage the rest of the festival." Above all we love music and we love making it sound as good as it possibly can. Over a decade of experience and our engineers still love their work. Your artists will find us friendly and professional, your managers will find us flexible and courteous. Innerfield is owned by the engineers which means we can offer the very best sound at a reasonable price without having to find a margin for any business people. Whatever your event, whatever size stage or type of music, contact Innerfield for a quote and delight your audience and artists alike.